A small update has just been released on Steam that fixes a handful of the most common bugs that cropped up since we launched a week ago. Our testing audience increased from just 4 people to thousands, so I'm not surprised a few things slipped through the net! Thanks all the bug reports people took time to make around the place, it really helped us track down some of these issues. It’s been a manic week, but work hasn’t slowed down on the game. -	Fixed a rare crash that could sometimes occur on saving (it would look as if the save bar had got stuck). -	Fixed a bug where the salvage menu option for the town leader sometimes disappeared. -	Fixed a bug where you could sometimes get stuck on the menu following a raid. -	Fixed a bug where you could sometimes get stuck on the menu following a religious exile. -	Fixed an issue with the save game name entry box appearing on the title screen. -	A few typos fixed. There are still other bugs in the game of course, but we'll sort them in a bigger patch. Our priority is now gameplay changes and bigger system changes. That’s going to take a while, but I’ll post regular updates so you can see how things are progressing. Once again, thanks to everybody who took a chance on us and bought and supported the game so far. We did not expect (or even hope) the game would find an audience as big as it has so soon. 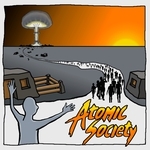 I know Atomic Society isn’t for everybody, but if you like what’s there already, you’re probably going to love it by the time we’re finished. I'll be in touch on the forums and things in the meanwhile.